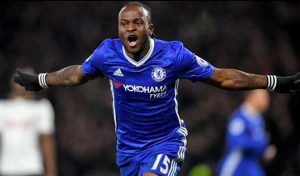 Gernot Rohr, Super Eagles Coach, says Victor Moses can return to the Super Eagles whenever he wants but he should be ready to work hard for a place in the team. Rohr made the comment on the sidelines of the Nigeria Professional Football League (NPFL) game between MFM FC and Rangers International FC. “Victor Moses is a player with lots of quality but stopped playing for the National team after the World Cup. We have to respect his decision not to play again,” the coach said on Wednesday. Rohr said he would present the fittest team in the last match of the AFCON qualifiers against Seychelles and the friendly match against Egypt. “We will invite the fittest players for the AFCON qualifiers against Seychelles and the friendly match against Egypt. The best of them will play the match,” he said.